My chest hurts. My face hurts. My nose hurts! My throat hurts! But I’m trying not to call out of work. I’m trying to hang in there. Because I know it’ll get worse than this. You know, I always have wicked awful first semesters. I know. I know. I’m not in school anymore. But the semesters carry through as those months. And my first semester, between September-December… always the worst. Anything bad that can happen usually does. My second semesters usually rock! I have amazing luck in my second semesters and amazing stuff happens to me during those. And summers… well they are kinda neutral. They can go either way. But first semesters…. the worst. The absolute worst. I just want to get through these next couple months without so many bruises. What proceeded was absolutely the best laugh I have ever heard in my life. On the way home from the Regina Spektor concert last night, I drove through my old school and past the places I had hung out so long ago. That moment was what I thought of when I drove past that house. Out of all the moments I had in that house, that was the first thing I thought of. Of course I picked up my cell phone to call him just to say hi. I had some amazing friends in that little life I had built for myself there. And I need to stay more in contact with those people than I have been. Which I started to today a bit. Sometimes it takes looking at the past to figure out where you want to go from where you are right now. It helps you remember what’s important. What has always been important. Why I ever thought telling someone that they looked Bruce Springsteen Streets of Philadelphia good is totally beyond me now. It definitely sounded really good at the time. 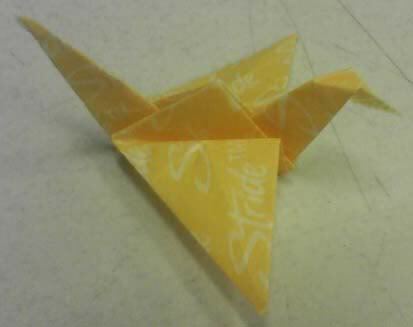 A little yellow starburst crane one of the guys up in the newsroom gave me. It’s so little! How did he do that? will never be anything other than a blogger…. I had 184 blog views today. You know I’ve been blogging since I was 15 years old. It’s true. I started building websites when I was 11/12, I believe. The first website, a Sailor Moon website. Hey! I was young. Young enough to remember that parents back in that day were so afraid of their kids using AOL instant messager because of predators that it was a big deal. I taught myself how to build websites too. I learned it the old fashion way… html. Trial and error. I can code html with the big boys. And previous to all of this, my fingers first touched a computer around 2. I learned how to navigate DOS land soon after that so I could play my games, like Jill of the Jungle. And things kinda snowballed through the rest of my life to today. I was raised a complete geek honestly. There’s no getting around that. But blogging…. blogging came really naturally to me. I wanted to be a writer, but I felt that I sucked. But blogging… I enjoyed it. I blogged before the term blog ever came to be. I think I just called it my online journal. And I kept it hidden in the depths of the internet for a long time, never telling anyone about it, until it started to surface just before I graduated high school. And as soon as people started to see it, read it, pay attention to it… that’s when I started learning the rules of blogging. Unwritten rules. It’s possible today that somewhere on the internet someone has devoted an entire site to the unwritten rules of blogging, but I give you some here for the hell of it. 1) Don’t write what you really truly want to keep to yourself. You are not invisible. Seriously… people will see it. Even if you think they won’t, they will. But also backfired on me in the middle of my relationship with a boy the first semester of my sophomore year. It was the truth and nothing but the truth and I’m sure things worked out the way they probably should of. For many years, I really did think I was invisible and no one actually saw or read my blog. It’s become far more apparent as time goes by that I wasn’t and am not as invisible as I thought. Even in the sea of millions and millions of blogs these days, somehow… somewhere… you write one bad thing about someone once and the chances sky rocket into the “oh! they’ll read it” zone and then word of that will definitely get back to you. Watch things blow up from there. In fact, I’ve found that (side rule here) the bad things have a higher chance of being read than the amazingly good things. Those… you never hear about. 2) Keep your relationships out of your blog. When Josh and I started dating, I really really liked him and in turn decided that I wouldn’t dismantle things by talking about him in my blog. That felt really important to me at the time. So…. he was hardly ever mentioned. A brief “He” four word sentence here and there, but that was it. I wouldn’t rant about a fight we had or some issue I had with him. I’d do my best to talk to him about it rather than the world because it wasn’t the world’s business. 3) When you do break up with someone, and it’s a nasty break up, all bets are off. It really depends on the magnitude of the break up, I think. It’d be nice to stay friends with your ex and that it’s a smooth transition. No reason to mince them up verbally on the internet. Wouldn’t that be perfect? It hardly ever is. I’ve seen pictures surface in blogs after break ups. Secrets spilling out. Poems written and out for display. Extreme rants of the worse kind. Because the most important part of this rule is: Dismantle them verbally in your blog if you could give a crap about maintaining a relationship with them. But if you do care, don’t! 4) Remember these rules when you are involved with another blogger. Seriously… it’s all fun and games until it happens to you. And if you get into a relationship with another blogger, establish actual rules and don’t get too upset if one day you are mentioned in their blog because you’re probably doing it too. I try to hard to stick by the rules, but it’s really easy to remember them when I’ve already broken them a few times over the years and seen what happens when you do. I know employers out there could find my blog. The boy I love. His family. My family. I try to stick to very superfacial things, politics, Britney Spears latest mess. If I ever do mention my relationship in my blogs, it’s usally so seldom and little. There are a lot of young bloggers out there. Be smart please. Learn from your elders’ mistakes. And with all the technology out there, know that your blogs will probably still be up online for employers to see by the time you go out into the world looking for careers. I guess unless you really want to buck the system and be an extreme blogger. But that usually goes one of two ways, so that’s up to you. So 184 blog views…. I can’t imagine and can only imagine all at the same time. For a split second, i was weak and i told him to take the job. i wish i just kept saying, “school is important.” because it is in a way. But in that one second where i didn’t say “school is important” is where he heard me. I shouldn’t have said it. I didn’t mean it because what i meant to say was “school is important”. They aren’t wrong. I’m a pretty good example of that. Don’t get me wrong here, I absolutely love my job. I hope it continues to get better and better because I want to stay and keep doing what i’m doing. But I definitely didn’t go to school for it. School was important to me though. At the time…. Or maybe it was only important to me because I built a life there. Still.. completing school looks good on applications and resumes. Impresses future employers.